Growth in the tourism industry is likely to slow to a crawl this year as tourists tighten their belts ahead of a weakening global economy. The Singapore dollar is also likely to stay strong against regional currencies, further deterring regional tourists from raising their spending. 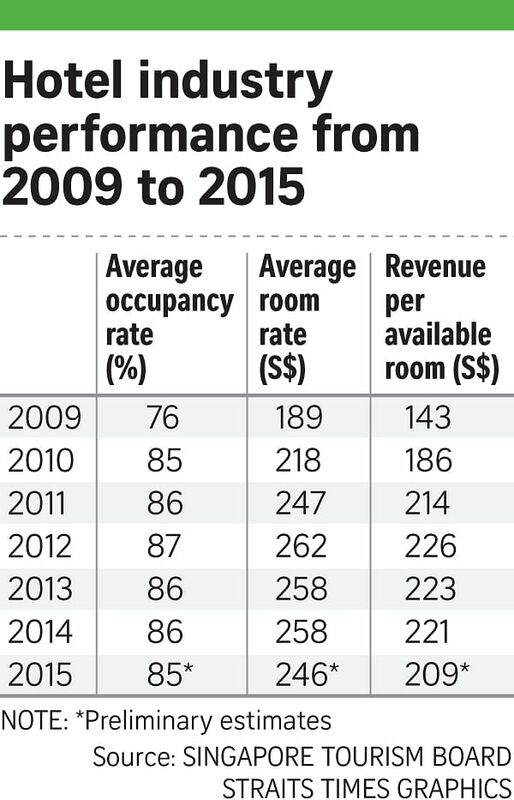 All this will add up to a challenging year for the sector, said the Singapore Tourism Board. "Global economic growth may be hampered by the slower growth momentum of the Chinese and United States economies, as well as uncertainties such as the ongoing reforms in China and the impact of the normalisation of the US monetary conditions," it said. "Increasing regional competition will also pose challenges to Singapore's tourism sector." Last year, visitor arrivals inched up 0.9 per cent year on year to 15.2 million but tourism spending fell 6.8 per cent to $22 billion. This is below the long-established target - set in 2004 - of 17 million visitors and $30 billion in tourism receipts by 2015. The main reason for the fall was fewer business travellers and less spending per person . Depreciating currencies of top source markets like Indonesia, Malaysia and Australia also contributed significantly to lower arrivals and spending. Growth (2010 vs 2015): An increase of 3.1 per cent and 5.5 per cent compound annual growth rate in tourism receipts and visitor arrivals respectively. Key industries include the integrated resorts, hotels, cruise, travel agents, attractions and arts and entertainment. This year, STB forecasts tourism receipts to grow by zero to 2 per cent to be in the range of $22 billion to $22.4 billion. Visitor arrivals are expected to be between 15.2 million and 15.7 million, a growth of zero to 3 per cent. Analysts said these challenges are not new and there has to be a concerted effort to rethink Singapore's proposition as a tourist destination. Apart from exploring new visitor markets, such as secondary cities in China and India, Singapore should consider how it can better market its local heritage and culture to attract repeat visitors, said Ngee Ann Polytechnic's senior tourism lecturer Michael Chiam. Mr Kevin Cheong, chairman of the Association of Singapore Attractions, said attractions here need to emphasise diversity, uniqueness and authenticity. Attractions will have to work together to attract visitors to Singapore, he added. Singapore faces competition from other destinations such as Malaysia, Thailand and Australia, which have relatively weaker currencies. He added: "Due to these competitive market forces, industry players will be forced to review our pricing structures downwards to stay in the game." At least one tourist agrees. Ms Andrea Sander, 31, a tourist from Norway who was in Singapore last week, said she found the food in hawker centres value for money, but is holding back from spending on other items. "I'm not here to buy clothing and other things, but for the food and experience. Everything else is as expensive as it is in Norway," she said.